We’d love your help. 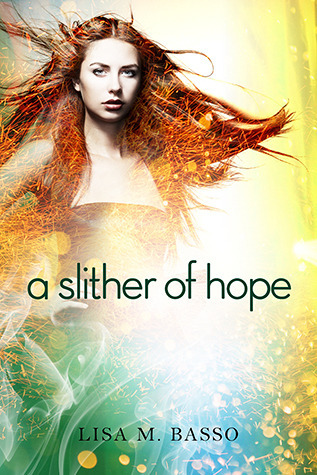 Let us know what’s wrong with this preview of A Slither of Hope by Lisa M. Basso. To ask other readers questions about A Slither of Hope, please sign up. A Shimmer of Angles (first book in this series) was a product of my wondering at NetGalley. It was really hard to resist that cover and when I saw it's about my favorite angles I knew I had to get it. I did and luckily it was an amazing start of a new series. If you wish to know more about the first book in this series, check out my review. Now I'll tell you a bit more about its sequel A Slither of Hope. I really hoped that this series will become one of my f Review also posted at Ja čitam, a ti? I really hoped that this series will become one of my favorite as it was finally a good story about angels. It wasn't typical (it's actually everything but typical), but I had slight problems with this one. I was glad to see Rayna again and I was glad that the two of us continued from where we started. I still don't like some of her choices she made but she is still pretty likable. What I liked the most here are her willingness to grow as a character and how she decided not to whine in the corner but actually started learning and fighting. Another thing that really brought some new elements are new characters. They really make twists and turns interesting. What I had problems with here is Kade. He is not really a bad character as he is that bad boy some girls will fall for, but not me. Despite everything I'm still Cam's girl and I wish there was more of him more. Still the story progressed nicely and I cannot wait to see how it all ends. A Slither Of Hope continues right after Rayna moves in with Kade. More evil comes their way, evil that has gotten them separated, in more ways than one. New discoveries, new beginnings will happen in the sequel of the Angel Sight series. I probably say the same thing of every book I read, but this Young Adult Paranormal book had me on edge. I was literally biting my nails because the intensity of the story was so strong; even the iPad fell from my hands once (at least it fell on my lap, otherwise it would have had a not so pleasant future). In every scene that Rayna running, trying to escape, or in any compromising situation, I could feel my heart beating so fast, as if I was running with her, going through the emotions myself and I'm not even the character. I could feel the emotions soaring through her in every chapter of the book. A part of this book I read while being at a doctor's appointment and it was a rather suspense packed part (Okay, it wasn't only a part; it was half of the book). I think people thought I was crazy because I kept saying "oh my god" and "what the hell" along with throwing my hands in the air. Another 5 star book in the second installment of the Angel Sight series! In this book we find Rayna who can see angels still struggling and Kade is struggling as well. I knew Rayna was going to choose Kade in the first book, I just knew it! But will the new dangers that are coming their way destroy that bond? You will have to read it to find out! I loved this book just as much as the first one, it was hard to put down once you started reading it, and Kade makes as much of a great hero as Ray do Another 5 star book in the second installment of the Angel Sight series! In this book we find Rayna who can see angels still struggling and Kade is struggling as well. I knew Rayna was going to choose Kade in the first book, I just knew it! But will the new dangers that are coming their way destroy that bond? You will have to read it to find out! I loved this book just as much as the first one, it was hard to put down once you started reading it, and Kade makes as much of a great hero as Ray does a heroine! I like Cam as a character, but I really love Kade, he is so complex and fighting so many demons inside and outside himself. I really felt bad for Rayna when she finds out about her mom though in this book, it was quite a shocker! In book one, A Shimmer of Angels, I became a fan of author Lisa M. Basso and her novel. As a fan of tomes angelic and such, I became enchanted by Basso's take on the Fallen, Angels and Seraphim. Rayna, 16, believed she was mentally ill since she could see wings on certain people. When she learns that celestial beings actually exist and she has a unique gift called The Sight, the novel took off as readers meet the dark Fallen angel Kade and the glorious angel, Cam. Both men are great looking and In book one, A Shimmer of Angels, I became a fan of author Lisa M. Basso and her novel. As a fan of tomes angelic and such, I became enchanted by Basso's take on the Fallen, Angels and Seraphim. Rayna, 16, believed she was mentally ill since she could see wings on certain people. When she learns that celestial beings actually exist and she has a unique gift called The Sight, the novel took off as readers meet the dark Fallen angel Kade and the glorious angel, Cam. Both men are great looking and develop some level of affection for Rayna. What exactly is Rayna? By book's end, we know she has something special, but exactly what and why she has developed said gift is a mystery. Book two, A Slither of Hope, begins with that mystery as Rayna and all those involved with finding out more about her, also delve into the important role she is to play in this supernatural world. The word "war" is mentioned by both sides and Rayna, now estranged from her family because of what ensued in book one, is now living with Kade. When Cam returns, the dynamics of her already-messed up life intensify as both angel and Fallen need to unearth exactly what is going on and why their kind are increasing in the city of San Francisco. Rayna or Ray as she's called, grows in this installment into a stronger, very inquisitive young woman. She's angry, filled with questions, and is tired of being treated the way she has by the angels she's encountered. Her feelings for Kade have changed and she tries to figure out exactly what's going on as he tries to teach her how to defend herself. Cam returns and this time I wasn't as taken with his white means good angel mystique. None of the guys in her life can be fully trusted, including her so-called best friend Lee. When an accident has her returning to her family, the drama and mysteries unfold and I knew something big was coming about her mother. The writing as usual had me glued to each word. I love Basso's descriptions and have grown to love Ray's voice and her strange situations. The setting of San Francisco only increases my interest in the story. Kade also grew on me and a part of me still cares for Cam. I did wonder why such older beings would like a sixteen year old human girl, but this is paranormal and reality concerns always take a back seat to wonder and mystery. The fantasy world the author has created continues to draw me in as I wonder what will happen in the third book. First appeared at In Vogue with Books. Gorgeous. Wonderful. Well, compared to A Shimmer of Angels, you may sometimes feel it lacking the action elements but that didn't bother me from enjoying the book. A Slither of Hope is more like a book that shows the not-too-action-packed surroundings before the big storm hits ( in A Matter of Time, hopefully). Rayna is still trying to come in terms with the changes in her appearance, her life and her fe First appeared at In Vogue with Books. Gorgeous. Wonderful. Well, compared to A Shimmer of Angels, you may sometimes feel it lacking the action elements but that didn't bother me from enjoying the book. A Slither of Hope is more like a book that shows the not-too-action-packed surroundings before the big storm hits ( in A Matter of Time, hopefully). Rayna is still trying to come in terms with the changes in her appearance, her life and her feelings. There are fights, killings and encounters; of course the author won’t write a book only with character fillers will she?? Though comparatively there isn't a lot nail-biting action I really like the way the story progresses, making space for the future plot to take place. I really really reeeeeeeeeeeeeeallly liked Kade. If you are Team Cam, prepare to be heartbroken to see less Cam and MORE Kade…and author Lisa M. Basso makes sure there are enough chapters from Kade’s pov (where Cam gets nada..HAH! In your face!) Since there was satisfactorily sufficient amount of Kade-ness throughout the book, I may or may not have gotten a little biased to actually observe how he contributes to the plot :p But whatever he does, he is Ah-mazing and totally rocks (like that’s a totally useful information for those who haven’t read). Seriously though, if the book had to rely solely on Ray’s pov I’m afraid it might’ve turned into a confused and lost teen’s journal or something close to that. Kade’s perspective makes it a lot easier to understand his feelings and pain, inner turmoil and also the situation at hand to realize how much trouble Ray is in. What I loved the most (apart from that darkly handsome and painstakingly reckless and attractive persona) is possibly that his character remains the same here as well. Like a lot of other books where the badass Fallen guy/badboy gets mercilessly butchered in the second book to an utterly pathetic, gag-worthy, lovelorn lost soul *pukes*, Kade doesn't change much. If anything, he is more developed in regards to acting more indifferent and…something I can’t just put into words. I mean, the author makes sure he doesn't look pathetically in love with Ray to turn the world upside down or anything, and yet he somehow is, without ruining his character. That is what I really, really ADORED. Oh wow, I cannot believe what this book does for me!!! Rayna is confused and frustrated now more than ever. She has no idea what's going on with her and nobody seems to have the answers she's looking for. However, she's a strong character. She can take care of herself and she doesn't want to rely on anyone. In this second installment in the Angel Sight series, we learn a lot more about Kade's past and how deeply connected he's with Rayna. He wants to be with her but he doesn't make the first step because he's waiting for Rayna. He wants this to be her choice. He would do anything for her, even kill or get killed in order to keep her safe but she's still not over Cam. I believe that Rayna fell for Cam first and not Kade because he was an angel which means he's one of the good guys. But when Rayna needed help, Kade was the one who rescued her from the SS Crazy and kept her hidden. A Slither of Hope picks up where A Shimmer of Angels ended, with Rayna moving in with Kade. Everybody is looking for her, the police, the SS Crazy, the Fallen, the angels and of course her family. For Rayna, being seen in public is no longer an option. The only thing she has to do is keep training with Kade and staying out of trouble. But when her father has an accident, she must go see him and her little sister. Apart from the family drama, she has to deal with the new pair of grey wings she now has. She must learn how to fly and why are they grey, when the angels have white and the Fallen black. The wings put her in grave danger because now she's a target. Both the angels and the Fallen want to use her as weapon in the war between the two supernatural creatures. And let's not forget about boy trouble. There are times where she can't stand Kade and other times she wants to kiss him. With Cam, things are different. She can't be with him because then he will end up exactly as Kade, a Fallen. Moreover, we find out the shocking truth about Rayna's mother insanity and death.Who did this to her and how does this affect Rayna? Let me tell you this: you will not see it coming! This series had me hooked from the very beginning, and this book was no exception. Rayna is still dealing with the repercussions of everything that happened in the first book (if you haven't read my review of A Shimmer of Angels, stop now, scroll down and find the link and go read that instead, because I do not promise there will be no spolers for that book in this review). Now of course, this would not be a YA novel if there was not your usual love triangle. But the love triangle here is anything but ordinary. After all, here we have Rayna caught up between Cam, an Angel, and Kade, the Fallen. And she has no idea what her feelings are for either of them. And how can she sort through all of that with everything going on and everyone after her? I really enjoyed reading this story because it is so much different from the usual fantasy fare. There are no vampires, no werewolves, no faires and no mythical creatures. Well, there are angels, and there is talk of Lucifer and his many minions. And of course, there are the nine circles of hell and all, but you know, that's nothing unusual, right? So, this is the 2nd book in the series, and I was thankfully given both by the publishers to review – phew! as you really do need to follow on with the story, these are not complete books in that sense. So I’ll review both together. Firstly, the concept of Angels is an old one, but its just really starting to hit through on teen fiction. I’m a big fan of the Mortal Instruments series and the theme of good vs evil is a common one, that most readers can really get behind. From a writer’s perspective So, this is the 2nd book in the series, and I was thankfully given both by the publishers to review – phew! as you really do need to follow on with the story, these are not complete books in that sense. So I’ll review both together. The front covers of both books are great – they are well branded and attractive – and really do express the essence of the protagonist – so well done Month9 books for that! The ending was pretty wowzers it was an exciting cliffhanger not a bad one. What does that mean? It came at the heals of some pretty shocking revelations and it was like WHAT THE HECK?! Now what?.. Now I wait because I feel like I really need to know what is going to happen. This wasn’t my favorite everyone and everything is completely messed up. Hopefully the next book brings a brighter outcome. My feels about the book I would say the story is interesting enough but there's so much that was...I dunno lacking? Could be better? The character I love the most is Kade. By far and Let me tell you, this guy does some pretty messed up stuff. Thats just my opinion though just because I didn't love it doesn't mean you won't love it either. Its good enough that I want to see how it will all play out, but I'm also not shouting from the rooftops. I'm waiting for that amazing turn around I just hope it comes. Ja Feel? Another solid book in the Angel Sight series. Basso promises an exhilarating read, following Rayna through the aftermath of the first exciting book. New angels (on both sides of the spectrum) come into play as Rayna tries to piece her life back together. I enjoyed this book and am on the edge of my seat, waiting for book three! Oh, and PS, still totally Team Kade! This book was a really quick read that was short and sweet. I liked the first one a little better just, because it had more world building and plot. I love all the characters and the premise of this book. The ending left me wanting more! I hope to get my hands on the next one ASAP. I wish this book was more well known, because I think many people would enjoy it as much as I did! WHEN WILL THIS BOOK BE IN THE LIBRARIES?!?! It's published but there is no blurb! Me wants. Lisa M. Basso was born and raised in San Francisco, California. She is a lover of books, video games, animals, and baking (not baking with animals though). As a child she would crawl into worlds of her own creation and get lost for hours. Her love for YA fiction started with a simple school reading assignment: S.E. Hinton’s The Outsiders. When not reading or writing she can usually be found at hom Lisa M. Basso was born and raised in San Francisco, California. She is a lover of books, video games, animals, and baking (not baking with animals though). As a child she would crawl into worlds of her own creation and get lost for hours. Her love for YA fiction started with a simple school reading assignment: S.E. Hinton’s The Outsiders. When not reading or writing she can usually be found at home with The Best Husband that Ever Lived ™ and her two darling (and sometimes evil) cats, Kitties A and B.